This is an introductory workshop for an all-female solo jazz dance troupe. You will learn an entirely new choreography and will get to explore a variety of dance formations as well as different rhythms and syncopation in your solo jazz dancing. Well, it's fun and really useful for that time when a good song is playing and all the leaders are taken. Plus solo jazz enhances the quality of movement and creativity in your own partner dancing. It kind of started that way if you remember old MGM movies with images of synchronised dancing flapper girls. But gentlemen if you're interested, drop us a message and we'll discuss something special for you too! Do I need to know jazz? Stay hydrated: Bring water with you. The studio sells bottled water as well just in case you need extra. Shoes: Please bring a pair of flat shoes for dancing. (e.g. Flats or sneakers similar to Keds/Converse) Outside shoes are alright as long as sand or mud are removed from the soles before entering the studio. Nabihan discovered lindy hop in 2008 and has been dancing ever since. She emphasises connection, musicality, fun and playfulness in partner social dancing. She's also a lover of solo jazz dancing and believes that you as an individual should be dancing first before dancing with someone else. Nabihan regularly teaches Lindy Hop and solo jazz with LindyKL. 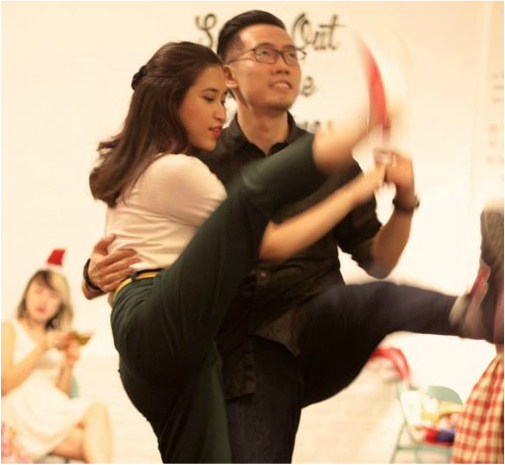 She also won 2nd Place for the Lindy Hop Jack 'n' Jill competition at Singapore Lindy Revolution 2014.